Make no mistake about it: Donald Trump is seriously damaging his presidency like an impulsive teen who dings, scratches, scrapes, bangs, and smashes, his shiny new foreign sports car. (I guess a "richie" teen, much like Trump himself was! and I guess a Russian sports car??? Russians are not known for fine automobiles! a Putin-mobile, I guess. LOL). They said Reagan was made of Teflon, nothing stuck to him (poor Jimmy Carter was made of Velcro, everything stuck to him)...but eventually, Iran-Contra stuck to Reagan, and his presidency was significantly curtailed after that...just had an odor about it. Unless Trump is the Anti-Christ himself, eventually he must succumb to his self-inflicted wounds. The only caveat: it is very, very early on...and Trump has a record for defying the odds..."ah! but there's the rub": it is very, very early on and he is not pacing himself and there's a long slog ahead for him (for all of us!). Therefore, a greater chance for failure, with so much chaos this early on, before even establishing himself as president (he's an amateur, clearly...you may want to give him points for "keeping his promises" to his core-supporters --- but that itself is the sign of a neophyte, the rash-and-rushed nature off his moves and lack of consensus-building, since effectiveness dictates "slow-and-steady" and line up support). Yes, I know that during the campaign everyone, left-and-right, thought, "Well this time he's really done it! He is done!" And he wasn't. But, the presidency is different --- it's not enough to simply stir up a "primed" crowd with hidden prejudices, economic frustrations, and in awe of Trump's celebrity billionaire status. You are dealing, in a humorless, deadly serious manner, with other "big boy and big girl" power-brokers: the Senate, the House, career diplomats, agency bureaucracies (hurray for bureaucrats, who can obfuscate Trump at every turn! you never thought you'd cheer the bureaucracy, huh? ), etc. with tons of expertise and experience...and as well a public that is increasingly disenchanted with Trump, well beyond any, naive "give him a chance" meme, including independents who voted for him, that now will turn on him and let their representatives, including Republican members of Congress, know. 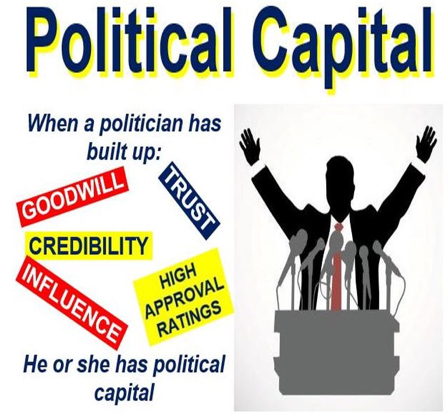 Trump is losing a president's greatest asset (with the exception of the "bully pulpit" which remains to be seen how effectively "Mr. Twitter" uses it, since he is not very eloquent): political capital! Trump is hemorrhaging political capital like I have seen no president do since Richard Nixon during Watergate! Political capital is like when you were a kid and got a select amount of cash for your birthday...now the question is: how can I best use it? what do I really want most? will I impulsively blow it all on crappy stuff and regret it later? The trouble is Trump, being a spoiled rich brat all his life, has been used to getting everything he has ever wanted. Let's hope that now, ironically, Trump finally hits a wall (get it? a "WALL"? Hey, I'm trying here! )...and dings, scratches, scrapes, bangs, and smashes, his shiny new foreign sports car. Yes, for the first time in my life, and I was a square kid aware of the presidency since I was 6 (LBJ), I do not wish the United States president success. Even with Nixon, Ford, Reagan, and the two Bushes, I was not happy as a liberal --- but I was civil, opposed them on certain issues, but took the role of "loyal opposition," saw their redeeming features, and considered them my president. As I have previously written in this blog, I feel Trump engendered no good will during the campaign , transition, and now the first days of his administration. I feel I owe him nothing, not even basic respect. And, as I have also previously said: that is the saddest thing of this entire mess. MJ will be a regular contributor on The Davy V. Blog. Please be sure to check back to read his column.